Our apartment is situated in a calm and green residence, located in the Mondello area. It is luminous and sunny all year round. The living area has an open space with an ample kitchen with a dining area. The sleeping area has a double bedroom and a bedroom with three beds. There are two bathrooms, both with a shower. The shady terrace with flowers is a comfortable place to have dinner or to relax with a book. There is a collection of books and magazines available for guests to discover the many interesting aspects of Palermo and Sicily. Comfort is guaranteed in every season, due to a modern air-conditioning unit for both summer and winter, well-finished and functional furniture, a satellite TV, and a DVD player. The reserved parking space is secure, as the entrance of the residence is secured with automatic gates. The garden has lush tropical plants. A monitored swimming pool with solarium area is usable in summer from June to September. The house sits in a calm area surrounded by greenery and silence, an ideal position for visiting Palermo. It is about 10 minutes walking from the centre of Mondello, an ancient fisherman town and renowned for its sandy beach. "Very nice, clean and nicely done flat. Just 5 minutes walk from main road for food shopping. 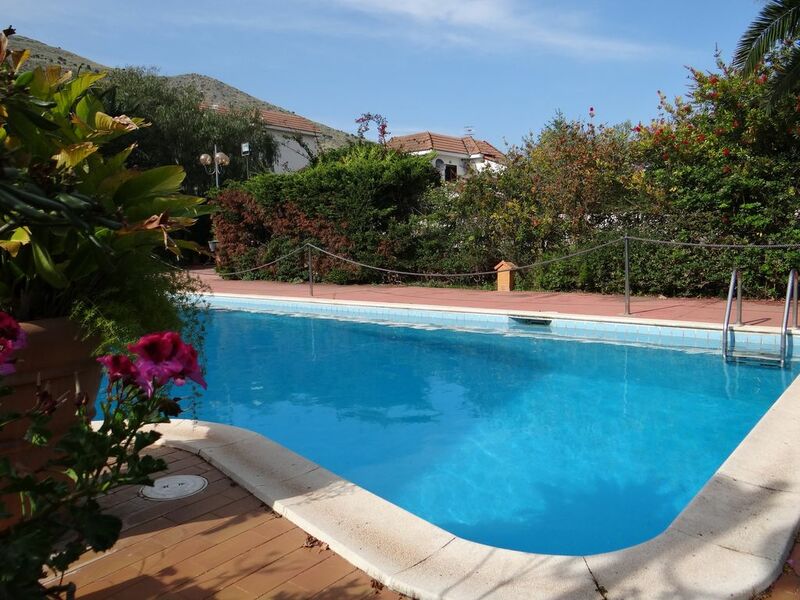 Short drive to Palermo city centre and very close to Mondello beach. Owner very very helpful and excellent host! I'm very happy after 2 weeks in Mondello. The flat is very baeutifull !! Résidence très agréable, propre, bien entretenue, sécurisée. Les résidents respectueux et très agréables également. La piscine est superbe, avec eau à bonne température, et peu de personnes présentes, du coup une grande piscine pour nous seuls, les enfants étaient ravis !! présence d'un maître nageur en plus !! "Nous avons passé 1 semaine de vacances parfaite en mai 2011 (couple avec 2 enfants). L''appartement est très lumineux, très bien équipé, et l''on se sent comme chez soi. Il y avait même des livres et des guides ce que nous avons trouvé très agréable. Tout proche, il y avait de très bons commerces pour faire ses courses. Séjour parfait pour visiter Palerme et l''Ouest de la Sicile." "Nous avons (2 adules et 3 enfants) loué cet appartement au mois d’avril 2010 et avons apprécié l’accueil, l’hospitalité et la gentillesse des propriétaires. L’endroit est vraiment calme, tranquille et idéal pour une famille. L'appartement est largement équipé et nous avons manqué de rien (yc équipement de bébé). Les commerces, la plage et même le bus pour aller à Palerme sont à 10 min. La résidence est sécurisée et l’appartement est grand. Rosario: many thanks for your help and kindness. "Très très satisfait. Accueil chaleureux des propriétaires. Appartement impeccable, très propre, tout confort (lave-vaissselle, lave-linge et TV présents). Place de parking très apprécié. Take motorway TP-PA to exit Sferracavallo/Mondello, then follow the seafront road until the Galatea junction. Return to Partanna Mondello and turn to road Catalano 63 junction. We recommend to visit the characteristic markets of Capo and Ballarò, an itinerary of the typical flavours and colours of Sicily. You can try some typical specialities for a snack, like "u sfincione" (Sicilian pizza), the "pane con a Meusa" (soft bread filled with chopped veal's lung and spleen), a sandwich with "panelle" (a Sicilian fritters made with gram flour). At Testaverde, a very good restaurant sits just five minutes walking distance from the house. There, you can taste authentic Sicilian specialities, like "arancine" (stuffed rice balls), pasta with sardines, the "caponata" an eggplant dish, and other specialities. In Palermo, we suggest to visit the Antica Focacceria S. Francesco, situated in the centre of the medieval quarter with an ancient style of cast iron and marble tables. For dessert lovers we suggest Bar Alba, in Don Bosco square, where you can taste all Sicilian dessert specialities, the cassata, cannoli, and traditional ice cream; at Cappello pastry shop, on Colonna Rotta Road, (behind Indipendenza Square) you must try Torta Setteveli and the glorious cannoli. We also suggest the Cavallaro bakery on S. Cuccia Road, you will not find it in any guide, but it is well worth a visit. Enjoy your meal!